Captain Gorfinkle returned to America after his service with the Peace Delegation was complete and continued his military service as part of the reserves. Promoted to Lieutenant Colonel, he organized many philanthropic campaigns to aid military service people in the Boston area between World Wars. 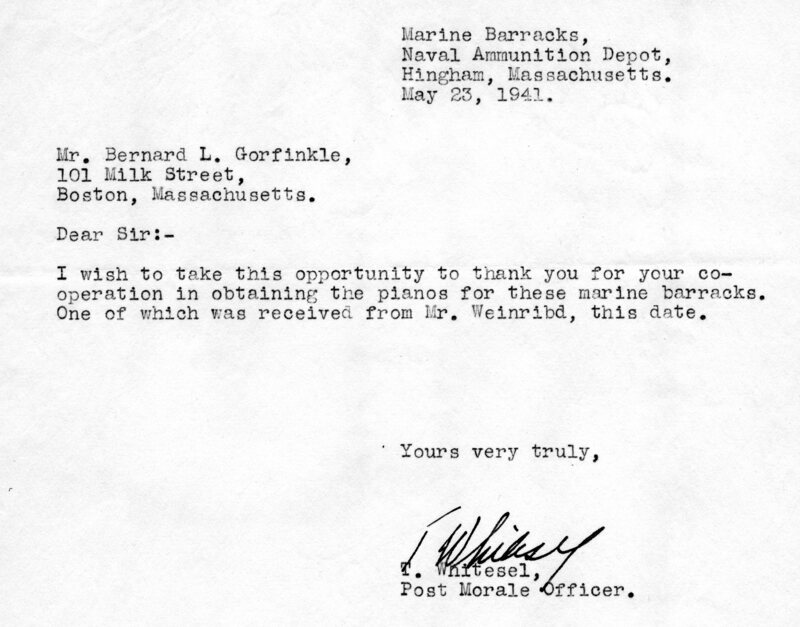 One charitable effort involved the donation of pianos to military bases throughout New England and beyond, including the Hingham Naval Ammunition Depot. Colonel Gorfinkle continued his patriotic service in World War II, serving as a member of the War Manpower Commission, appointed by President Roosevelt to oversee the New England region. After the war, he remained active in the Reserves, serving as military attaché for Massachusetts governors Christian Herter (1953-1957) and John Volpe (1962-1965). He finally retired from Reserve service in December 1965—at the age of 71. Besides his law practice and military service, he was an active philanthropist in the Boston area, and chief among his interests were Beth Israel Hospital, the Newton Tennis & Squash Club, which he helped found, and Brandeis University. The Colonel’s son, Herbert J. Gorfinkle, continued the family tradition of military service and was also involved in this country’s efforts during World War II. He was a member of the 381st Engineers Combat Battalion, which deployed to Europe following D-Day, serving as Unit photographer. His unit stayed in Germany for a year after the war helping rebuild that country’s infrastructure. 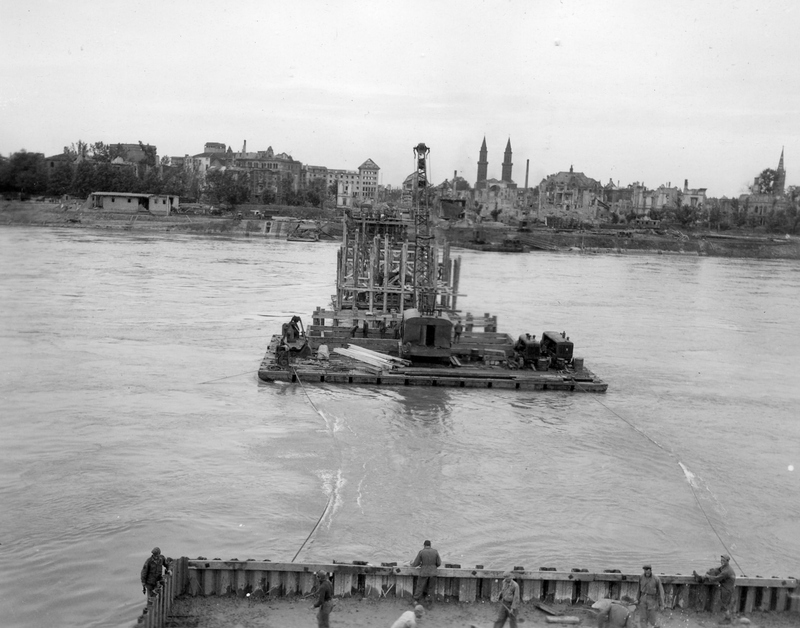 His collection contains many photos of bridges over the Rhine River which his unit was helping rebuild. It also includes letters home to friends and family. After the war, Herbert Gorfinkle completed his education at the University of New Hampshire in 1947 and then received a Master’s in Business Administration from New York University’s School of Retailing in 1948. He then started a successful career in the mercantile industry, serving as manager or founder for several successful retail chains including Jordan Marsh and the Edwards Stores of Boston. 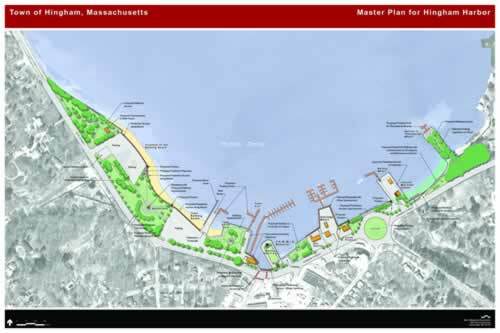 He and his wife, Connie, moved to Hingham from Braintree in 1972 and raised three daughters on Andrews Isle within the Home Meadows—near Hingham Harbor, which he helped champion as member (1983-1990) and Chairman (1988-1990) of the Harbor Development Committee. Herbert Gorfinkle was also a member of the Veterans of Foreign Wars Coast Guard Auxiliary and Commodore of the Metropolitan Yacht Club. This entry was posted in Uncategorized and tagged Archives, Gorfinkle family, Hingham Harbor Development Committee, John Richardson, World War II.